Ronda Rousey was never known for being a big boxer or stand up fighter. She was known for quickly taking fighters down and submitting them. This is why I don't understand why she attempted to box Nunes. So here are a few reasons she lost so quickly. 1- She didn't go for the take down immediately. She should have just charged in and do what she does best. 4- She was aggressive. 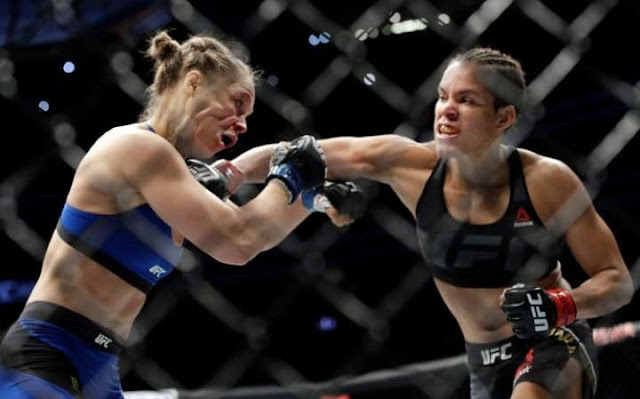 Ronda didn't seem focused but maybe Nunes was just that good. 5- Footwork! Rousey never had great footwork but she at least moved quickly. She was slow and tired on this night. I don't know if we will see Rousey in the Octagon again but she will take some time off.